Kichwa hip-hop dethrones the imagery of indigenous peoples as living in rural communities isolated from modernity. By Manuela PicqYou know hip-hop has become a universal language when indigenous peoples from the Andes use art forms developed by African-Americans in the south Bronx to contest power structures in Paris. It's not only that indigenous hip-hop represents the cosmopolitan, pop face of ancestral cultures. It is that hip-hop has become a tool to sing other worlds into existence, contributing alternative imaginaries in the pursuit for more, better democracies. The Ecuadorian band Los Nin raps blending Spanish with Kichwa, the pre-Columbian language spoken during the Inca Empire. 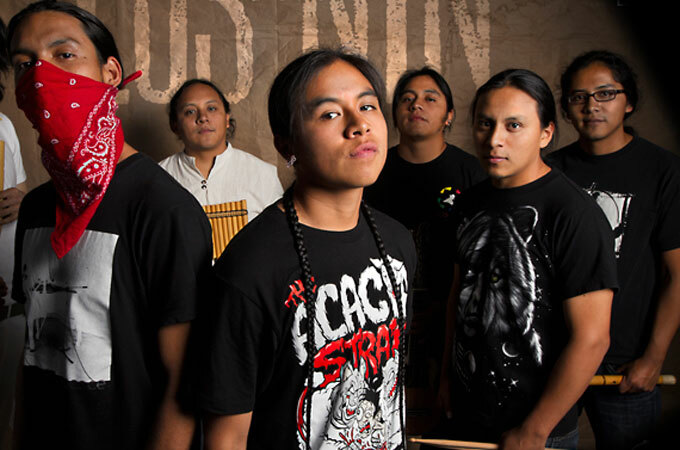 Their hip-hop has brought Los Nin international recognition. They have performed in the United States, Latin America and Europe. After Chicago and New York, Los Nin gathered crowds in Barcelona with their show Shinallami-Kanchik. They performed at Les Trois Baudets in Paris, the famous venue where musical icons such as George Brassens and Jacques Brel acquired celebrity status decades ago. "On stage Los Nin blend languages and native musical instruments like the Andean flute with more electric sounds." When they are not on an international tour, one may see Los Nin rapping among young crowds of Quito's indigenous bar--Cactus. The scene is the same as it would be in the Bronx, with students of communication and medicine gathering in a small venue to dance and collectively freestyle on the mic, except here the audience is a multilingual, multiethnic crowd, blending urban fashion with traditional attires. Comment: I'm guessing Kichwa is the same as or similar to Quechua, the Andean Indian language. For more on the subject, see Healing Natives Through Hip Hop and Bolivian Indigenous Hip Hop. I'd rather have Ecuadorian music make inroads into the US instead of having one of the country's more vapid cultural export take root there. There's already way too much tuneless rhyming over thudding preprogrammed drum tracks in the world already.